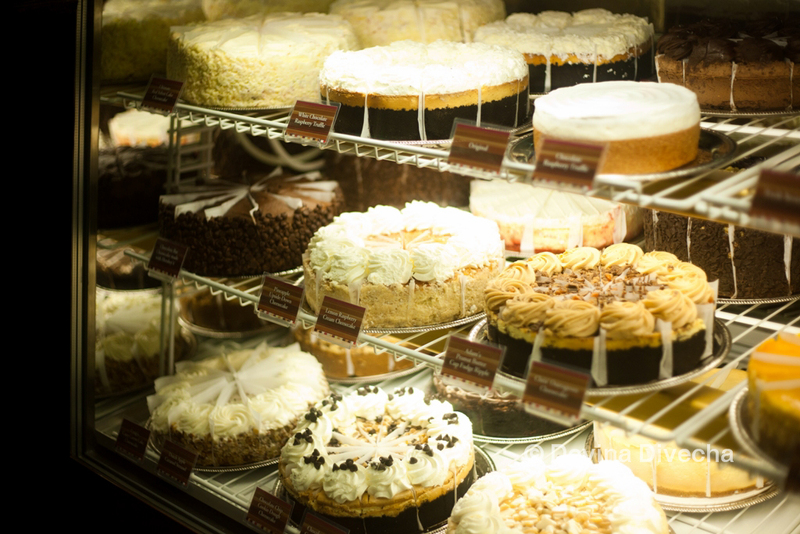 I had heard of The Cheesecake Factory years ago – in my mind, it was this mythical land where an innumerable number of cheesey cakes were produced for consumption by the hungry masses. 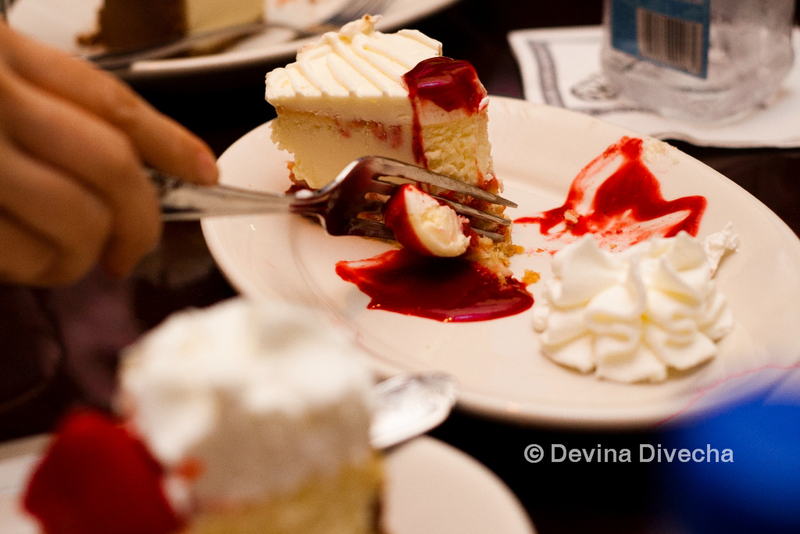 When I went to the USA last year, I had my first taste of cheesecake from this not-so-mythical place, which not only gave me a great experience, but upon perusing the menu, made me realize that they have so much more than JUST cheesecake. So when I, like many other cheesecake lovers, found out that a branch of the firm would be opening in the UAE, I was extremely excited. And when the invite to attend the opening landed in my inbox, I got even more bouncy with joy. The opening took place on Wednesday, August 15 2012, at its currently one-and-only international location in The Dubai Mall. Located right opposite the Aquarium, I think they’ve got an excellent spot to draw in the crowds. Having visited a branch in the USA before, I can say they’ve followed the general theme of interiors of a dull gold/yellow splattered everywhere. It makes for a cozy atmosphere, but if you’re eager to take photos in there…use a flash! 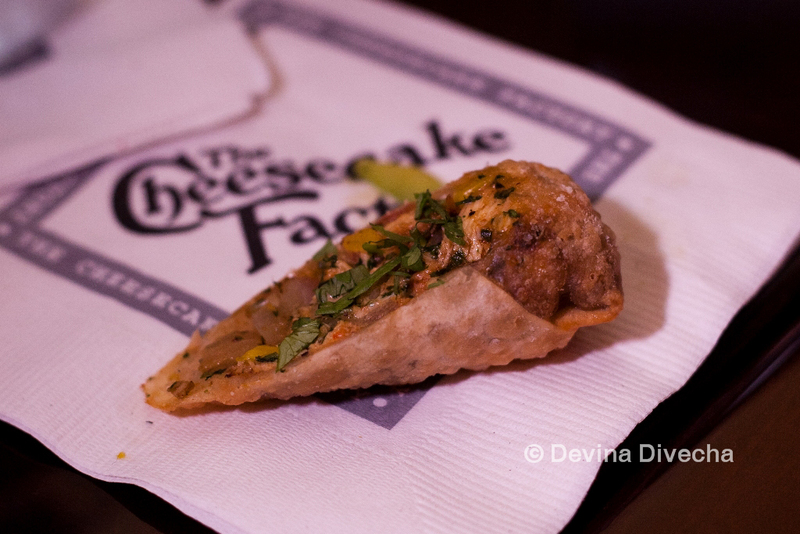 After the opening, we were treated to samplers of various food items from their menu, along with … cheesecakes, of course! To view all the pictures I took from the night, click here. 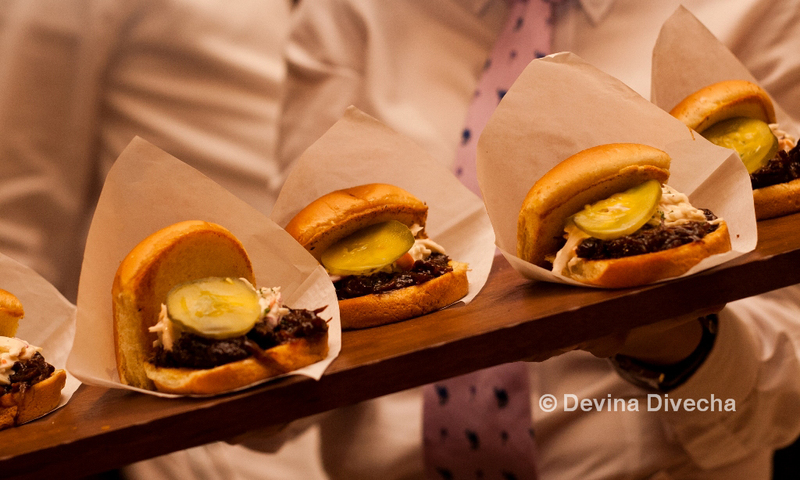 Beef burgers with, cole slaw, and pickle: I loved how soft the bread was. The pickle added to the taste, and the meat was tender and lavished with a bbq-y sauce. Not my favourite from the night though. 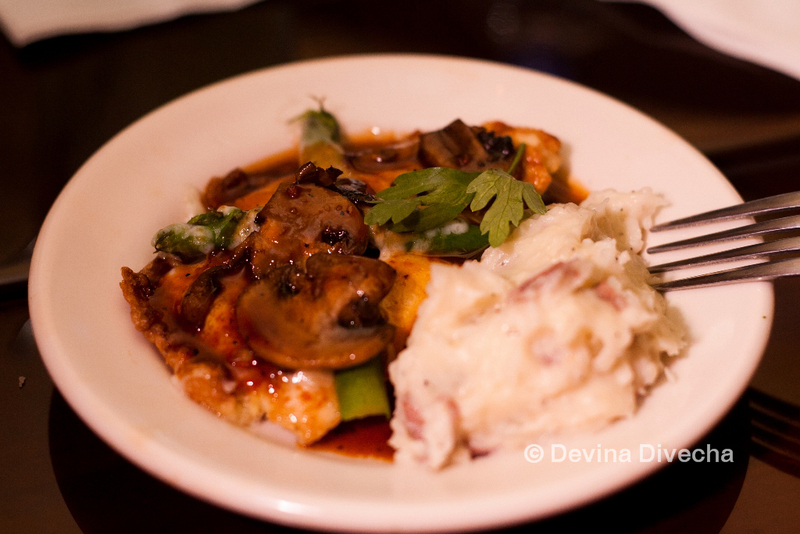 Chicken Madeira with mushrooms and/or Herb crusted salmon, mashed potatoes, and asparagus: I had a bite of both; they were average in my opinion. Chinese salad with plum dressing (in takeout container): Really, really, REALLY GOOD salad. There was chicken in the one I tried, and the vegetables used were fresh and crispy. 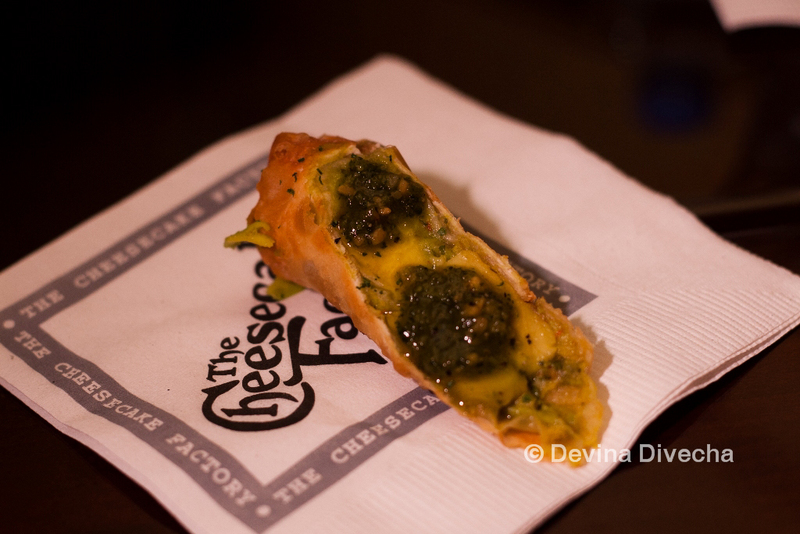 Tex mex egg roll: Really good stuff. I loved the taste of this alone without any sauce. Flavours were good. Salisbury steak: had a bite of this one; but unfortunately I only tasted it when it had gone a bit cold, so perhaps I’m not the best judge. 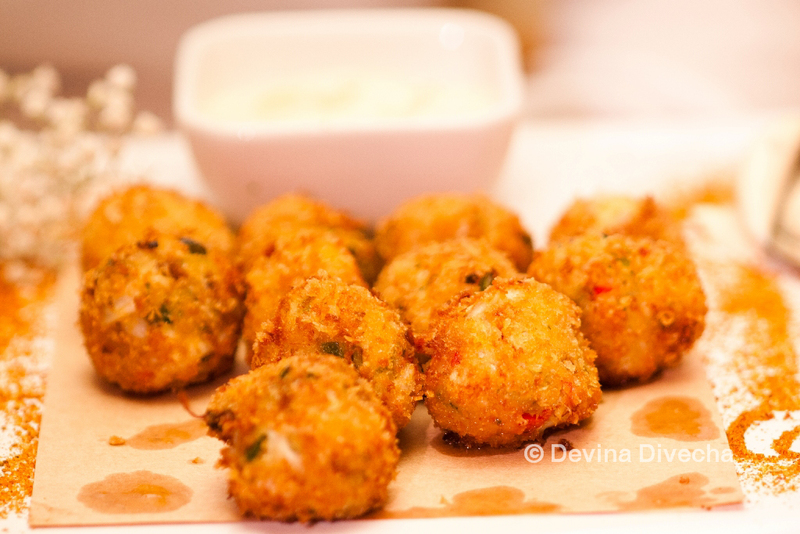 Mini crabcakes: Really good crabcakes! Crisp on the outside, but so tender on the inside. 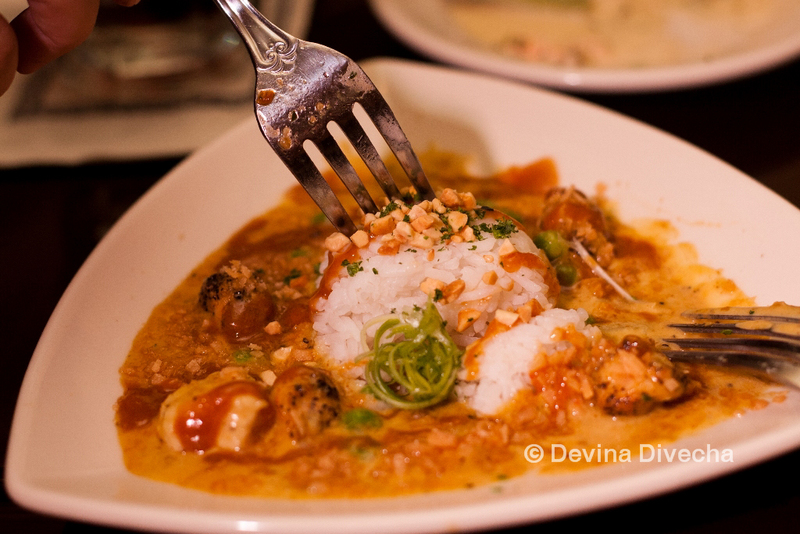 Bang Bang chicken: we were told this was a best-selling dish and I can certainly see why. The flavours were really good, and the peanuty sauce was excellent. There seemed to be a slight kick in the taste, although I’m not sure where it came from. This added to the overall dish…good stuff. Chicken samosa: Nice samosa. Doesn’t stand out in my memory but it was okay. An avocado roll I think. It was okay; didn’t stand out for me unfortunately. 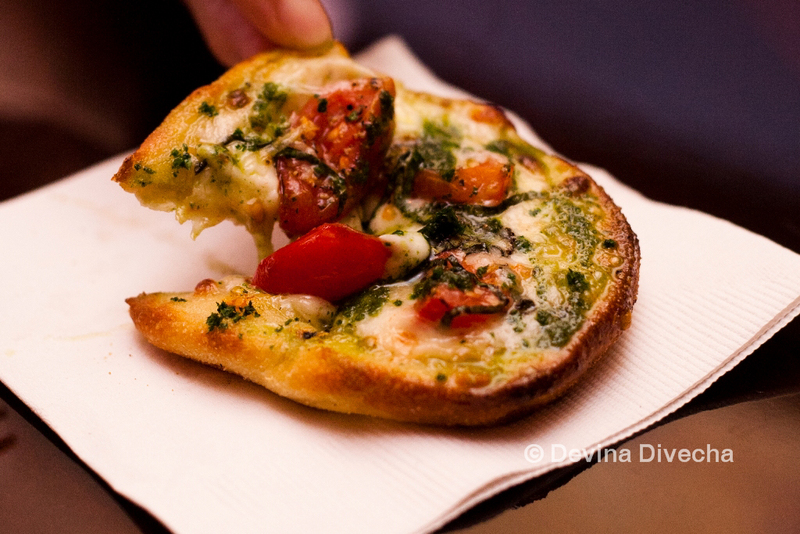 Pizza: I had this last and I can’t remember whether it had a specific name (someone tell me what it was!) but I really liked it. It was fresh, the vegetables felt fresh and it had this authentic feel to it. Lemon raspberry white truffle cheesecake: probably my favourite cheesecake from the night, I loved the sorbet taste I got from the raspberry and lemon combined with white chocolate. 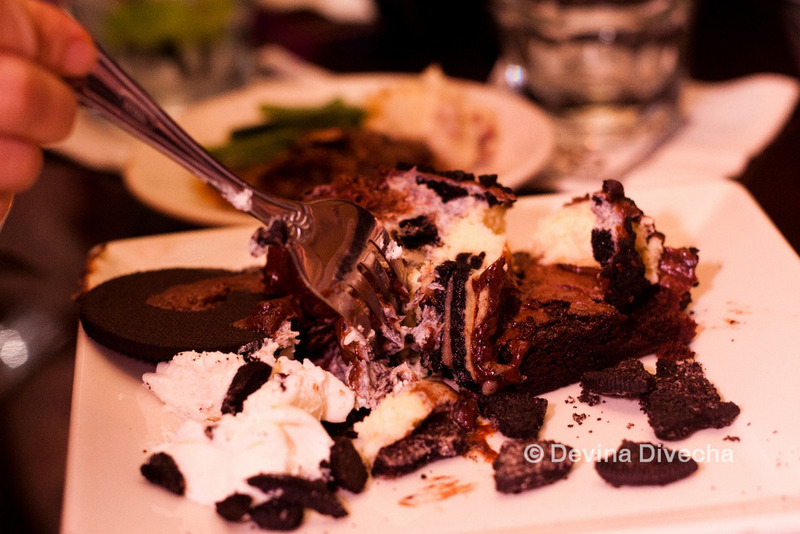 Oreo Dream Extreme cheesecake: This one was good, albeit a bit heavy. 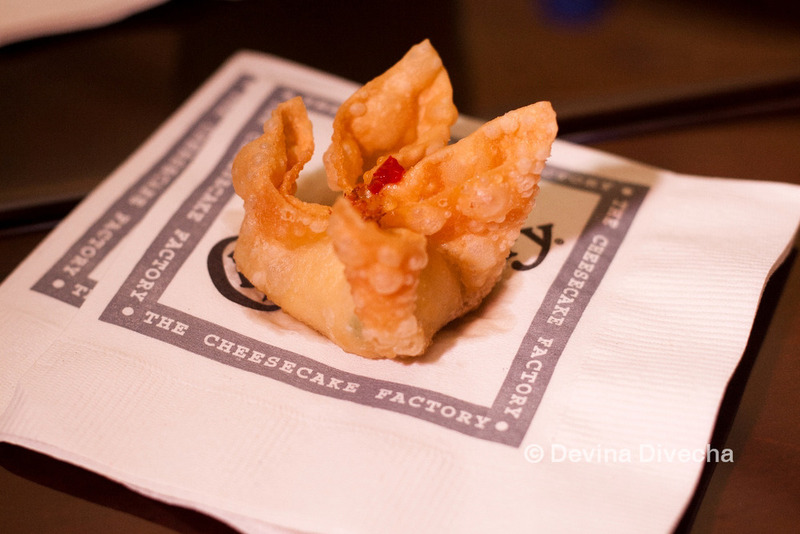 The original cheesecake: the original was absolutely awesome. Loved the classic taste mixed with strawberry. 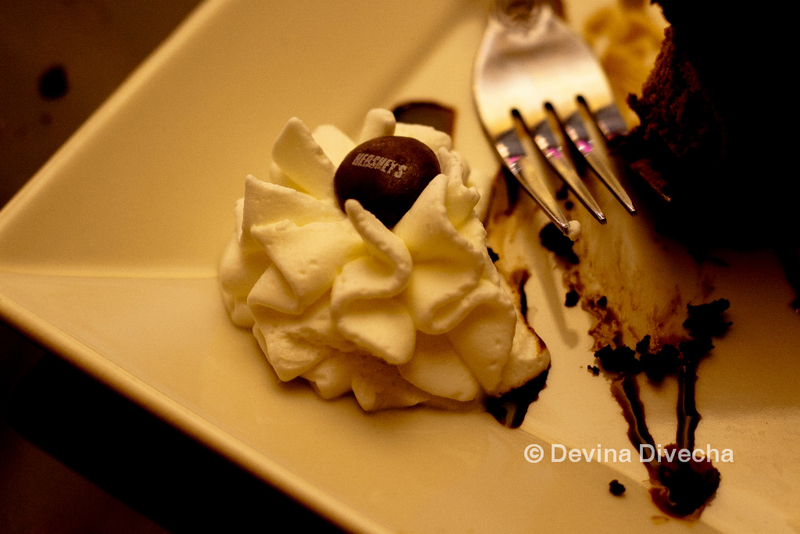 The Chocolate Bar cheesecake made with Hershey’s: I love chocolate but wow, was this one heavy even for me. 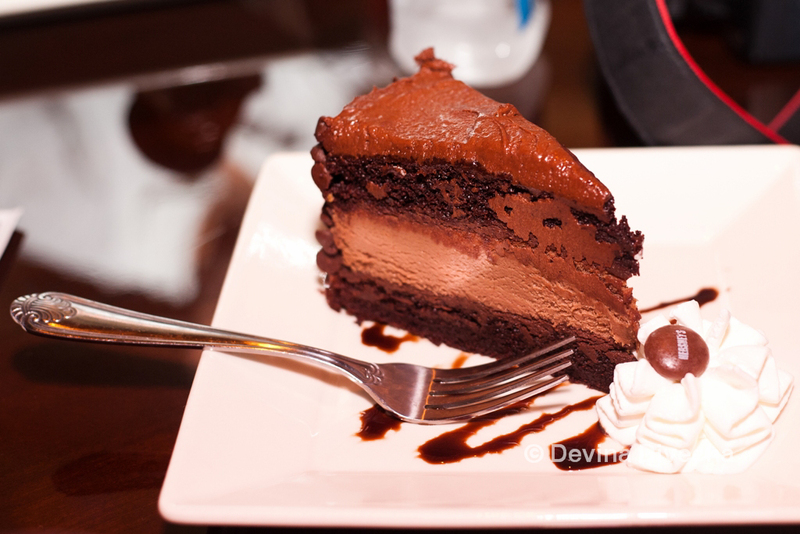 Loaded with chocolate, chocolate and more chocolate, this one’s only for the real, die-hard choc fans. It’s very sweet, so not for those who can’t handle too much sugar. We didn’t get to have a look at the official menu for Dubai, but were told there are over 300 items on the menu including the desserts, starters, mains and more. Once I get my hands on the menu, will update this post to give you an idea of how the dishes are priced. Whatever the pricing is like, I must point out the portions for each are quite generous, and even with the sampler sizes (except for the cheesecakes which were presented in their full-blown glory), we were stuffed! I cannot finish this post without a hat-tip to the staff. Enthusiastic, friendly and a diverse mix of nationalities, I was very impressed with their knowledge and ability to banter with the customers. 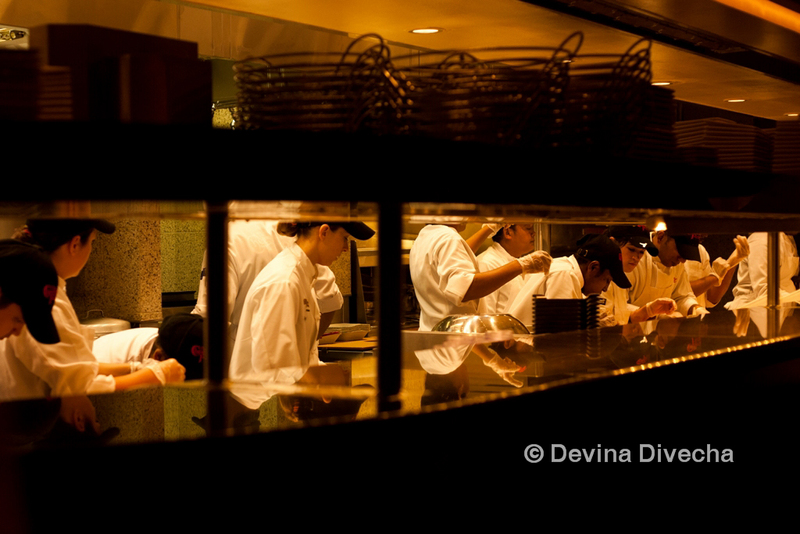 I only hope this keeps up after opening night, because it always helps to have restaurant staff whom you feel you can talk to. 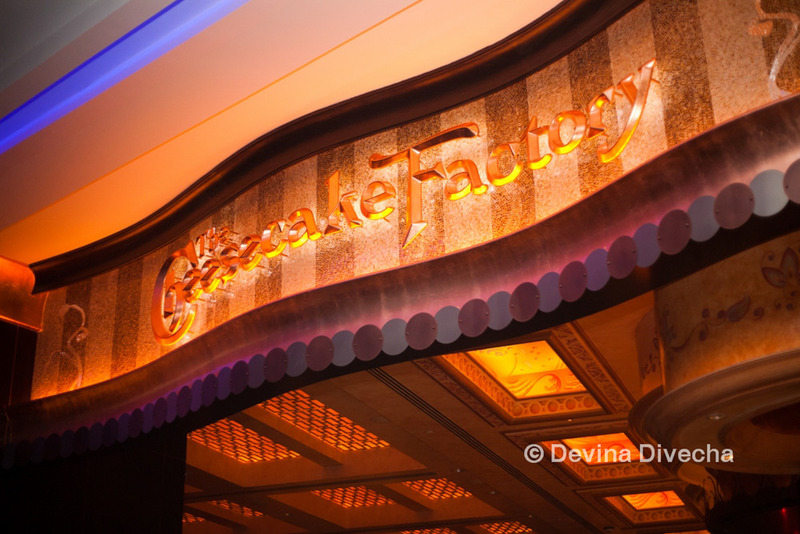 I think it’s definitely a great plan for Al Shaya to open The Cheesecake Factory smack in time for Eid. There’s a lot of seating space and a prime location to help it on its way. Oh, there’s even another branch scheduled to open by October of this year at Mall of the Emirates, so two cheesecake-y locations for us to enjoy! I think the night had its high points and average points. Which is a good sign. I’m hoping the restaurant continues to provide excellent service with good food even past the first few weeks of opening rush. I definitely look forward to going back and trying out more from the menu. Practical tips: Park in the Grand Parking of Dubai Mall and then walk towards the Dubai Aquarium. It’s right in front of the blue-scale area. Go with an empty stomach, and for heaven’s sake, don’t count the calories! Lovely photos, Devina. You really captured the festive food & ambiance of the place. The map is a nice touch, too. 😉 I agree, I think they timed it well to open right before Eid. drooling in front of my laptop. I wont count my calories but would consider the cost. what would be the price range? 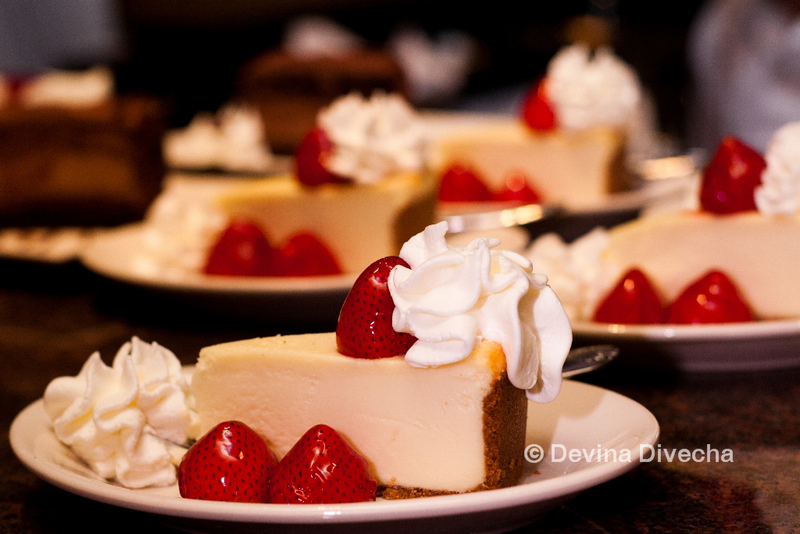 Nice pics, cheesecakes look divine. need to get myself down there soon! Thanks Holly! Yeah I always add a map at the end of my posts – if you click on the link below it will show you all the restaurants I’ve ever reviewed all over the word, with links back to the blog posts. Abigail – it’s great that you reminded me. I was meant to get the pricing from the PR company. Will chase that up. StuffYourFace and Tasmeea – thanks! Let me know what you think once you try it out! I have to say, I honestly thought this place was way too overrated in Dubai. The food/desserts are moderately good, but insanely overhyped. We waited for an hour and a half to get our table (heard some people had to wait upto 4 hours! ), and at the end of our meal – we left thinking it wasn’t worth the wait. Maybe it’s just me, but I would probably wait for the hype to go down before I decide to go back there and give it another shot. Just a thought! @themiddlepai Thanks for stopping by the blog 🙂 I went another time recently and waited for an hour to get a table… I do agree, I’d like to wait a bit until lines get less clogged before attempting to waste an hour in the mall! Good review, lovely pics and think the shout out to the staff is always appreciated. I still have no clue why there are queues for this though! Hey Sally! Thanks for your comment 🙂 I’ve no idea why there are queues either, especially considering the restaurant has a lot of space. Guess the novelty hasn’t worn off yet!